Africa is a region of huge opportunity - as has been observed for decades - but even bigger challenges. Africa’s airlines continue to struggle and collectively remain in the red while airlines in every other region in today’s favourable environment are profitable. Structural changes and a new mindset from African governments are desperately needed. Political interference and government meddling in airlines is a common problem, as well as protectionism and unnecessarily high taxation. In this report CAPA looks at the continued struggles of South African Airways and the new business models being pursued by Air Mauritius and TAAG – both of which are keen to develop new transit hubs. Ethiopian’s rapid growth and remarkable success highlight the opportunities in Africa that can be exploited with the right strategy. Most African airlines are unprofitable – even in the current environment of low fuel prices – and have a relatively bleak outlook. Government meddling is a common issue preventing airlines from making the right commercial and strategic decisions. The best of many examples of this is South African Airways (SAA), which once again is in dire straits after repeatedly failing to implement a long term business plan that addresses its longstanding challenges. After much deliberation, SAA’s previous management team put together a viable long-term business plan in 2013 (its ninth turnaround plan according to SAA chairperson Dudu Myeni), aimed primarily at restructuring its highly unprofitable long haul operation through route cuts, new partnerships and the acquisition of more efficient widebody aircraft. After multiple delays SAA made progress in implementing several components of the plan, including network restructuring with the suspension of services to Buenos Aires, Beijing and Mumbai. However other components were never implemented, including a comprehensive partnership with Emirates and the acquisition of new generation widebody aircraft. SAA also continues to operate unprofitable three weekly Johannesburg-Dakar-Washington Dulles flights, despite switching some Washington flights to a stopover in Accra, which has been successful. SAA’s losses have reduced significantly as network adjustments, lower fuel prices, and a renegotiation of A340 lease rates have resulted in a better performance for its previously highly unprofitable long haul operation. SAA currently serves only eight destinations outside Africa, using a fleet of 17 A340s and six A330s. However, the long-term prospects for the long haul operation remain bleak as SAA has not made sufficient changes. SAA cannot assume that fuel prices will remain at their current low level. A return of higher fuel prices would make it nearly impossible for the long haul operation to be profitable, particularly as SAA has again pushed back a long-delayed decision on new widebody aircraft. An even bigger setback with implementing the recovery plan occurred in mid-2015 when SAA board approval for a new partnership with Emirates was rescinded at the last moment, just hours before the deal was to be signed and announced. Emirates and SAA management had agreed to a comprehensive codeshare, and for SAA to operate alongside Emirates on the Johannesburg-Dubai route, with a rare revenue guarantee from Emirates. The Emirates partnership was to replace a much more limited partnership with Etihad – which has since been dissolved anyway, with SAA suspending codeshares and services to Abu Dhabi. The Emirates deal was critical for SAA’s long-term sustainability as it gave SAA a much stronger global offline network and finally the guaranteed revenue stream to turn the corner. Unfortunately, politics intervend and it would be very difficult for the partnership to be revived later if there is the political will. The two airlines now codeshare, but this is a much more muted relationship. SAA now faces the difficult prospect of competing in the international market over the long term without a partnership with Emirates or another Gulf airline. Emirates has more capacity to South Africa than the entire SAA long haul operation, and its huge global network provides a significant competitive advantage in the South Africa-Europe and South Africa-Asia markets. SAA is looking at resuming some long haul routes on its own but such routes are unlikely to be profitable, and would only be launched for political reasons. Nearly the entire SAA management team has left since mid-2015, resulting in more instability for an airline that has already seen a large succession of CEOs over the last decade. SAA is essentially now in limbo, forced to operate under the current status quo and unable to address any of the long term challenges until there is a change in government. Profitability at the EBITDAR level has improved, but SAA has a weak balance sheet and upcoming funding requirements; it needs another capital injection or government guarantee. Partial privatisation through the sale of an equity stake is highly unlikely in the current environment; any investor will require the control that the government has never been willing to relinquish. SAA also faces challenges in the domestic market, with South Africa’s sluggish economy impacting demand and competition intensifying. Its regional international operation, which historically has been the only profitable part of its business, also faces intensifying competition and weakening demand. SAA requires a fundamental transformation to be profitable over the long run. Unfortunately South Africa’s political environment has proven time and time again that such a transformation is impossible to implement. The alternative becomes increasingly obvious. There are lessons for other African countries to learn from this history, notably to avoid the temptation to meddle in their airlines. However, government meddling and protectionism are part of a deep-rooted tradition in the African airline sector that will be hard to break. A contrast is however emerging in Angola. The strategy being implemented by TAAG Angola following its partnership with Emirates represents a model that perhaps can be emulated by other ailing airlines in Africa. In late 2013 TAAG and Emirates forged an agreement to establish a strategic partnership. The partnership was initially slow to materialise, but over the past year Emirates has begun helping TAAG to restructure, and prepare a new business plan that aims for profitability by 2019. TAAG has been consistently unprofitable over the last several years, including losses totalling approximately USD220 million over the past two fiscal years. It now faces extremely challenging market conditions since Angola’s oil-based economy has been significantly impacted by the sharp decline in oil prices. Despite the challenges TAAG is expanding rapidly in 2016, with the delivery of two 777-300ERs in 1H2016 that were ordered when market conditions which were much more favourable. The Emirates partnership gives TAAG a much brighter long term outlook. A codeshare is now in the process of being implemented, which will extend TAAG’s network globally. Having dropped services to Dubai in 2015, TAAG is using the partnership to learn from Emirates and raise its standards. Emirates took over management of TAAG in Oct-2015, appointing industry veteran Peter Hill to serve as CEO and lead the transformation efforts. TAAG aims to improve its profitability by cutting costs, renegotiating costs and reducing staff levels through attrition. TAAG should be able to improve its efficiency significantly – efficiency being a systemic problem across Africa – and reduce unit costs. The two additional 777-300ERs represent a 15% expansion of TAAG’s fleet and an even higher rate of capacity expansion. TAAG is initially deploying the additional capacity to Brazil and Portugal – its two main long haul markets. In early Jun-2016 TAAG increased its Portugal operation to two daily flights, including 11 weekly frequencies to Lisbon and three weekly frequencies to Porto. In Jul-2016 TAAG is increasing its Brazil operation to one daily flight, including four weekly frequencies to São Paulo and three weekly frequencies to Rio de Janeiro. 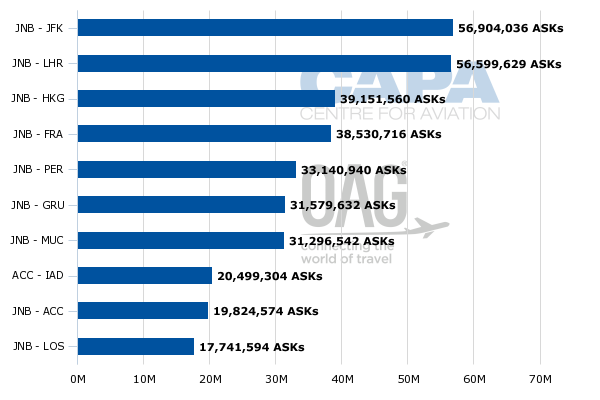 Portugal and Brazil will account for approximately 55% of TAAG’s international seat capacity once the increases are implemented. TAAG is also now looking at expanding in China, which is is currently served with two weekly Beijing flights and is its only other long haul market. The new business plan being implemented with the help of Emirates also envisages turning Luanda into a hub. “In the past it has never been used as hub. It now could be used as quite a significant hub for South and Southeast Africa”, Mr Hill told CAPA TV in Mar-2016. He added, “We are taking advantage of that. We are working with immigration, removing visa restrictions. There is a lot of positive things there. So I think our growth will come from not from traffic terminating or originating in Luanda but more from the surrounding countries in South and Southeast Africa”. 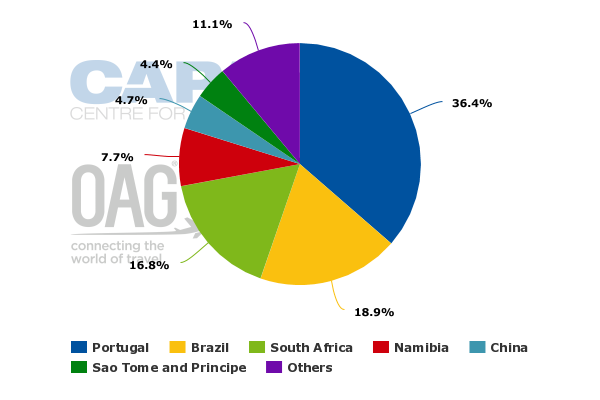 TAAG currently serves 12 regional international destinations in Africa along with 11 domestic destinations, according to OAG schedule data. However, none of its regional international routes are served daily. Even Luanda-Johannesburg, a key and historically highly lucrative business route, is only served with four weekly flights. TAAG deploys 777s to Johannesburg and also has three weekly 777 flights to Cape Town, making South Africa its largest regional international market by a wide margin. Namibia is TAAG’s second largest regional international market: served with four weekly 737 Luanda-Windhoek flights and three weekly 737 Lubango-Windhoek flights. TAAG will expand its regional network, which is operated with a fleet of 737s, as it restructures and reduces its reliance on its home market. More destinations in South and Southeast Africa are likely, along with more frequencies to increased destinations, which will provide passengers more regular connections in markets such as Cameroon-China, Zambia-Brazil and Namibia-Portugal. Improved regional connectivity is also key to the Emirates partnership as Emirates is beginning to use Luanda as a hub for secondary destinations in South and Southeast Africa. Emirates currently operates daily 777-300ER flights to Luanda, making it the largest foreign airline presence in the heavily regulated Angolan market. 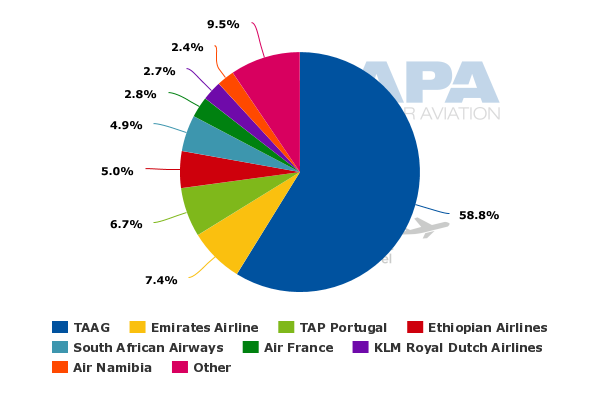 Combined, Emirates and TAAG currently account for approximately 66% of total international seat capacity at Luanda. A transit hub will be necessary if the airline is to be successful at fulfilling its goal of achieving more than triple its annual revenue stream by 2019. The hub strategy is also important for Angola as it would allow the government to leverage its investment in a new airport, which is expected to open in Luanda in 2017. Mauritius also has an ambitious plan to develop a new hub and expand its flag carrier with a new focus on transit traffic. Air Mauritius has historically been focused on point-to-point traffic including inbound visitors, but is eager to tap into rapid growth in traffic between Asia and continental Africa. Air Mauritius already has a strong network in Asia but is relatively weak regionally. In May-2016 the airline launched services to Maputo in Mozambique and Dar es Salaam in Tanzania – its first destinations in continental Africa outside South Africa and Kenya. Air Mauritius now serves six cities in continental Africa along with three destinations in neighbouring islands, giving it nine regional international destinations. It has a larger Asian network, which currently consist of 11 destinations. The airline is expected to launch several more African destinations by potentially using a new subsidiary, enabling it to leverage Mauritius’ ideal geographic position between Asia and Africa. A larger African network will provide a more balanced network and enable it to pursue more east-west flows, but will require rescheduling of some Asian flights and a larger narrowbody fleet. Similarly to TAAG Air Mauritius has a 12-aircraft fleet, and a high mix of widebody aircraft for a small airline. Currently it has six A340s (which are due to be replaced with A350s from 2017), four A319/A320s and two ATR 72s. Air Mauritius is also expanding in Asia, giving it more feed for its expanding regional network along with supporting tourism growth in the Vanilla Islands. Guangzhou is being launched in Jul-2016 giving Air Mauritius 12 destinations in Asia Pacific, including five in greater China along with Beijing, Hong Kong and Chengdu (the latter was launched in 2015). Air Mauritius also serves four Indian destinations (Bengaluru, Chennai, Delhi and Mumbai), two in Southeast Asia (Kuala Lumpur and Singapore) and Perth in Australia. Its European network is much smaller, consisting of only London and Paris. In Mar-2016 Singapore was upgraded from one-stop via Kuala Lumpur to a nonstop, as part of new partnership with Changi Airport. Air Mauritius is now using Singapore as a hub for offline destinations throughout Asia-Pacific. While in many cases a two-stop product is offered between Asia and Africa, this is competitive, and with the right scheduling Air Mauritius has the opportunity to offer some of the shortest travel times in the fast-growing Asia-Africa market. The new Africa-Asia hub should lead to a new era of growth for Air Mauritius, which has recorded only modest traffic growth over the last six years. Since 2010 Air Mauritius has had only one year of passenger growth exceeding 3%. 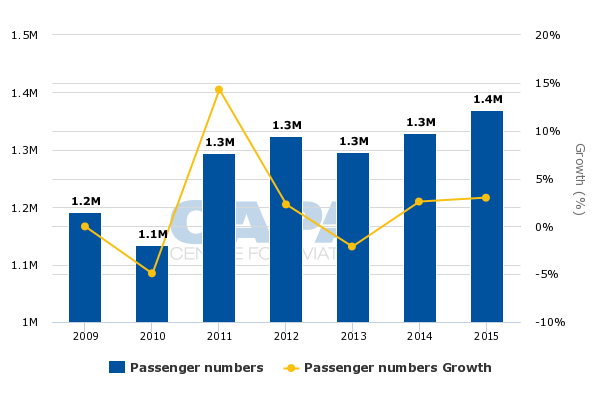 Although break-even on a cumulative basis over the last six years, the airline is also hoping to improve its profitability as transit traffic numbers increase. However, Air Mauritius will face intensifying competition in the Africa-Asia market. Ethiopian Airlines, particularly, has already been very successful in tapping into Africa-Asia growth; at the same time the Gulf airlines are aggressive competitors and Chinese airlines are starting to focus more on Africa. With the launch of Guangzhou Air Mauritius will surpass Ethiopian with the largest Asian network for an African airline. Ethiopian currently serves 11 destinations in Asia-Pacific but has nearly three times as much nonstop capacity to Asia as Air Mauritius. Ethiopian has expanded rapidly in Asia over the last several years, as well as regionally within Africa, recognising the huge opportunities in the Africa-Asia market. Ethiopian now has almost 50 regional international destinations, and almost 70 when its West African affiliate ASKY is included. Addis Ababa has emerged as the biggest hub in Africa and Ethiopian has emerged as Africa’s largest – as well as by far the most profitable – African airline group. Ethiopian has accumulated approximately USD800 million in profits over the last eight years while the rest of the African airline sector has incurred losses of approximately USD1.5 billion. It is hardly a surprise that smaller African airlines such as Air Mauritius are eager to try to emulate Ethiopian in pursuing more transit traffic. Ethiopian has doubled in size in the past five years, with Asia-Africa transit traffic driving a majority of the growth. During the same five years traffic at Africa’s other four main airline groups has been flat, or only grown modestly, and three of these groups have been highly unprofitable. Ethiopian plans to pursue further rapid fleet and network expansion, and it could be difficult for any smaller African airline to carve out a viable niche. The airline is also growing through acquisitions, as part of a strategy aimed at establishing a significant presence in all parts of Africa. In addition to its share in ASKY Ethiopian also has a stake in Malawian, and is looking at several other investment opportunities. For some small ailing airlines a tie-up with Ethiopian provides an opportunity. However, for several of Africa’s struggling airlines the prospect of Ethiopian becoming even stronger poses a challenge. African airlines will need to adopt new strategies and their government owners will need a dramatic shift in mindset if the sector is finally going to turn the corner. The success of Ethiopian provides an example of what can be achieved with the right strategy and government support. But in Africa there are far too many textbook examples of what not to do with an airline.